The school shoes are scuffed. Uniforms have begun to fade in the wash. The nerves from the first days of school are long-forgotten and the once precious, not-so-new school bags and shoes are now tossed into the corner of the kitchen. Since the kids began school nearly a month ago, they carry a new air of confidence and determination. School has piqued their curiosity. I watch as they thrive, and grow up so quickly right under my nose, that I’m afraid, if I blink, I might miss it. Every afternoon I await their prattle and in earnest they explain the new rules of school, as though school etiquette is entirely alien to me. ‘We must get into the líne Mummy’. Who’s a silly old mummy now? I feel any remaining street cred slowly trickling away. They sing me new songs and tell me of their new Irish words, many of which I’m not familiar with as I went to school in Northern Ireland where Irish is not compulsory. They raise an eyebrow on hearing that I don’t understand all the new words and at my poor pronunciation. Now they’re counting and doing sums on their fingers, learning the sounds of the alphabet through phonetics, and becoming frustrated with exceptions to the rule, like cat being spelt with ‘c’ when they think it should be spelt with ‘k’. In the playground, they have the chance to mingle with the big kids. Dylan in particular is in awe of the big boys and their ‘games’. He rushed to tell me how the big boys told him to close his eyes and then pushed him over! This rough and tumble is the epitome of fun for my rambunctious little boy. They’re beginning to compare themselves to the other children and ask for things the other kids have, like sparkly garish shoes with that annoying advert, cheese strings, juice and jam sandwiches. Their wants and influences are moving further beyond my control. Our white lies don’t seem to wash anymore. Last week Eva’s chicken went missing in the middle of the day and she searched for her whenever she could. 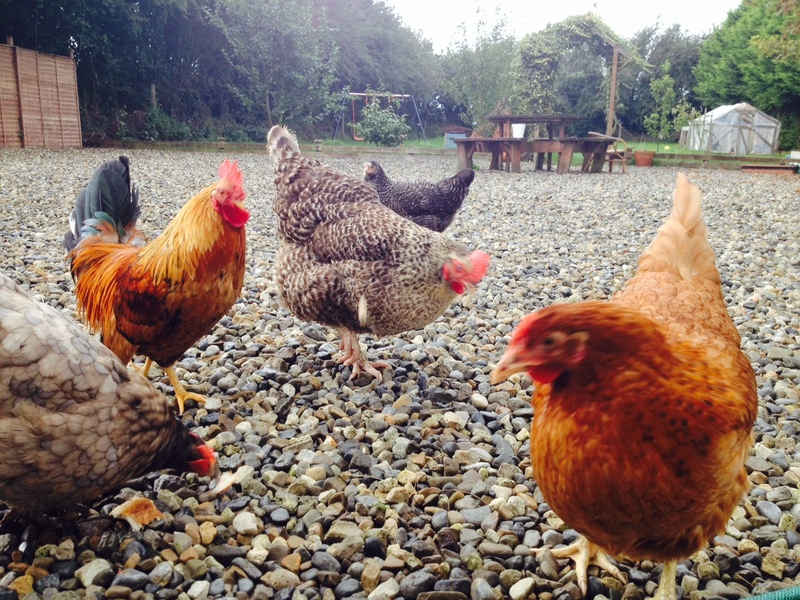 We tried to convince her that she hadn’t been taken by a fox, she’d just gone to play with the other chickens next door. Thankfully, she showed up two days later unscathed and looking plump. She had been playing next door after all. They’ve begun to climb trees and mastered pushing themselves on the swings, and boy, can they go high! The change I don’t like is how I pull them up for a snuggle and their long legs dangle down, nearly hitting my shins. How much longer can I do this before it looks really ridiculous? I can’t pull them up onto my lap as easily without risking a pulled muscle. They’re no longer little kids. They are school kids. Thank goodness they still love their mummy cuddles, bed-time stories and Mr Happy soup. 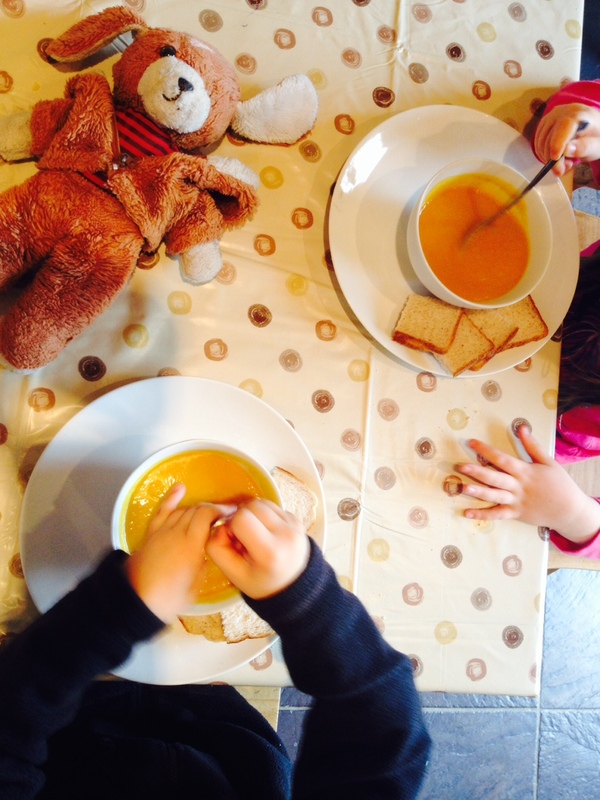 Here is my warming recipe for Mr Happy soup which they kids slurped up on this damp afternoon. ‘Mr Happy’ because I was trying to coerce them into eating it one day and they weren’t interested. When I explained how it wasn’t any ordinary soup, they totally bought it! It’s roughly the same shape and colour as Mr Happy from the Mr Men. 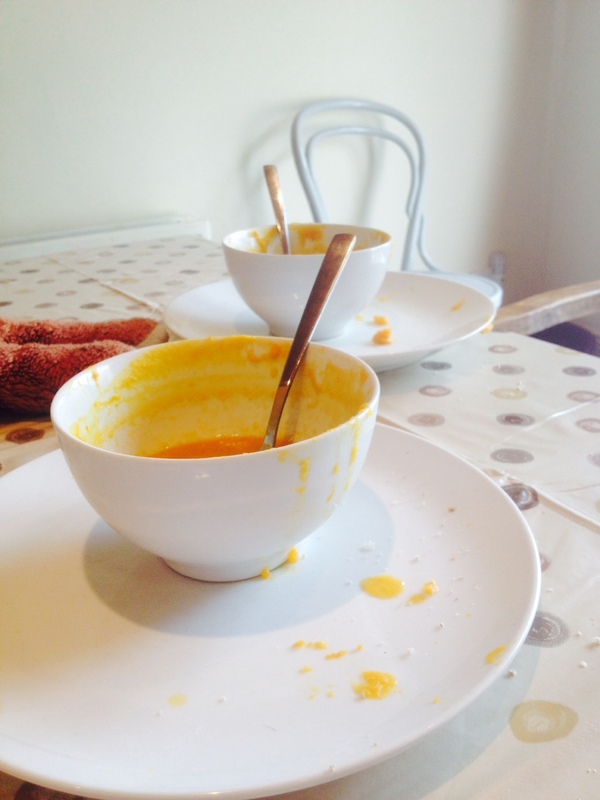 🙂 Today, the kids polished off all their soup and left the bread behind to feed to the chickens. 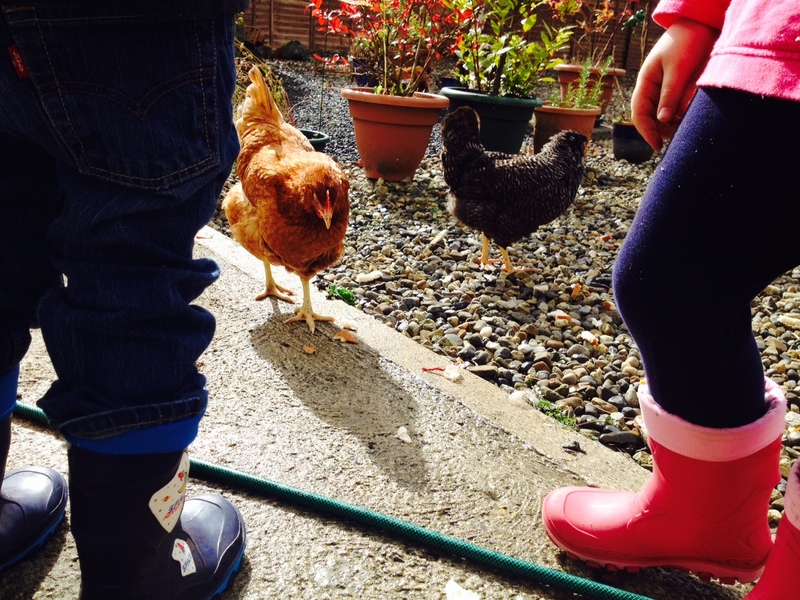 …to feed their bread to the chickens. 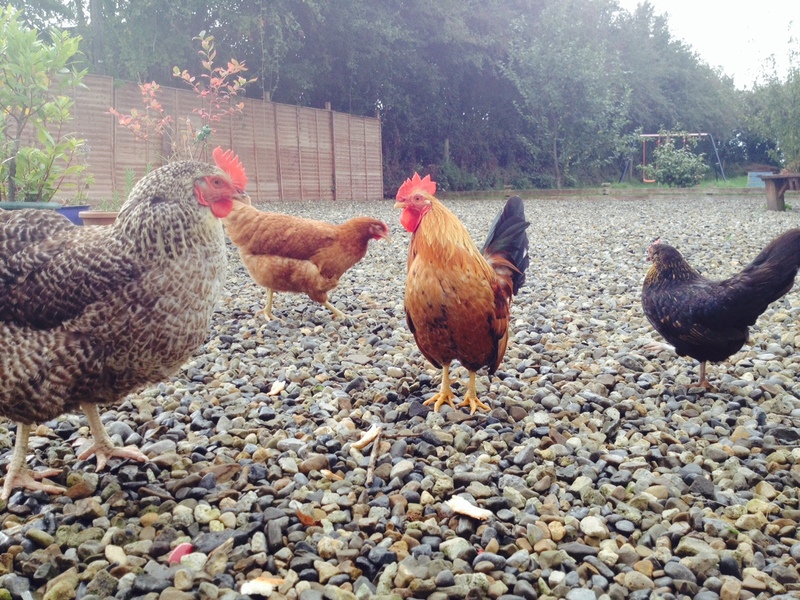 Not forgetting the ‘wee bantam’ on the right. ‹ Pinch me, please! I’m a Finalist in the Irish Blog Awards! Lovely photos. I fear my little monkeys will use words I don’t understand either when their level of French outstrips mine in a few years time! Thankfully you still have two little ones. Enjoy the little changes they are such fun, after a ‘lifetime’ of you being their main influence it is interesting to see someone elses effect on them. Thanks Jackie. I don’t think I’m terribly sad about it. It’s just happening a little too quickly for me. I never liked change. It’s incredible how fast they grow and change.